1. Lightly coat cookie sheet with olive oil. Place rinsed beans on cookie sheet in oven. turn oven to 425 and set timer for 6 minutes. 2. While oven is warming up and beans are drying in oven, combine all other ingredients in medium size bowl. 3. Transfer beans to mixture in bowl and coat evenly. Spread onto cookie sheet, and place in oven for 30 minutes. Check and toss every 5-10 minutes. 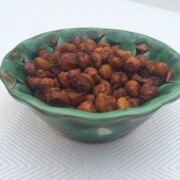 Chickpeas are done when golden brown and crunchy.